Pittsford Dental Excellence Center offers partial dentures as a way to get your teeth back and restore your smile. If you have lost teeth, a partial denture will improve your ability to eat and chew. The presence of a partial denture also protects your remaining natural teeth from shifting or becoming crooked, which can happen when a tooth is missing. Partial dentures are removable for when you sleep, and when they need to be cleaned. The traditional partial denture consists of replacement teeth that are bonded to an acrylic base covering a metal framework. This base is color-matched to your natural gums. 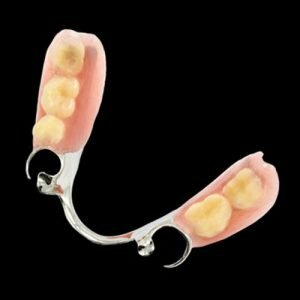 The framework, in combination with metal clasps, attaches to your natural teeth and holds the partial denture in place. At Pittsford Dental Excellence Center, we also offer metal-free partial dentures. This can be the best treatment option for patients who suffer from a metal allergy, or when esthetics is more of a concern. They blend in naturally with the gums because of the absence of metal clasps, and the prosthetic teeth can be matched in size and color to look completely natural. They are lighter weight, making it easier for you to get used to your new dentures, and their increased flexibility leads to a better fit and minimal irritation of the gums. They are highly durable, will not retain moisture, and resistant to odors and stains that occur from eating and drinking. If you have missing teeth, why deal with the inconvenience and loss of self-esteem any longer? 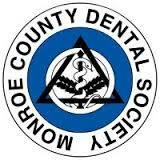 Let Pittsford Dental Excellence Center help. Our staff is experienced and trained in all aspects of restorative dentistry, including partial dentures. 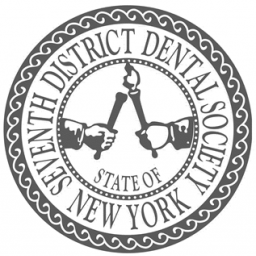 Call our Pittsford, NY office today at (585) 248-2575 to schedule a consultation. Pittsford Dental Excellence Center is here to provide comprehensive oral health care to patients living in the area of Fairport, Pittsford, and Rochester, NY.